Mention Potter Heigham to any Norfolk Broads holidaymaker and they will tell you of the medieval bridge which spans the river Thurne here. It certainly is a talking point as the arched bridge restricts passage for many boats which are too large to get under and those can require the services of the boat pilot to take them through. But there is more to Potter Heigham than the bridge. Here you will also find Lathams store, a sort of discount superstore where only the most defiant will come out with no purchases. People travel from miles around, some by coach, to visit this well known establishment. For those who would like to explore the rivers beyond the bridge but are unable to gain access, motorised dayboats are available to hire by the hour, half and full day. Beyond is Hickling Broad, Horsey Mere and Martham Broad with the villages of Hickling, Horsey and West Somerton waiting to be discovered. Each is within an afternoon's cruise from Potter Heigham. Free moorings are available either on the right hand side as you approach the bridge, or underneath the passenger walkway which marks the entrance to Herbert Woods boatyard on the left. Local Attractions: Watching boats squeeze through the impossibly tight bridge. Lathams Discount Superstore. 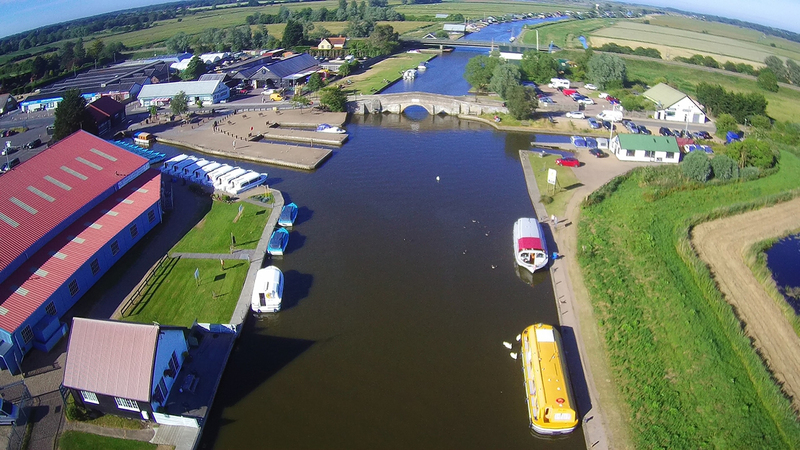 Dayboat hire to cruise the upper reaches of the Thurne. Eating and Drinking: The Norada is a newly opened public house (once the Broads Tavern). It offers a full and varied food menu and is closest to the river. The Falgate Inn (restaurant and bar food) is a 10 minute walk from the bridge. A Fish and Chip Restaurant and Takeaway is located adjacent to the bridge. Lathams Cafeteria - eat in or on the outdoor terrace. Bridgestones of Potter Heigham is a well thought off establishment offering hot and cold meals, snacks and refreshments and cakes worth putting the inches on for! Other Services: Lathams Fishing Emporium - near the bridge. Showers and toilets available within the Herbert Woods boatyard. The nearest Doctor is in nearby Ludham. 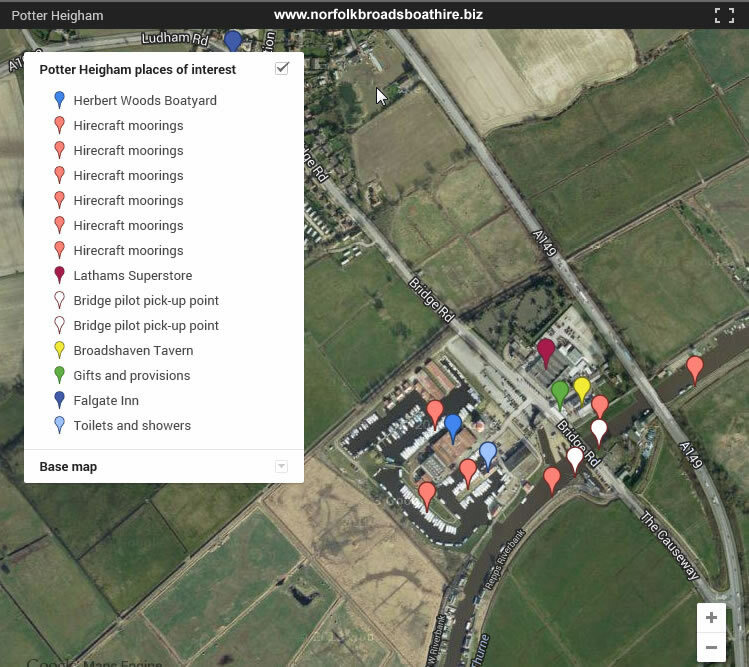 TIP: The best toilets and showers in Potter Heigham are to be found in Herbert Woods boatyard. They are both modern and clean. They are marked on the map below. Other toilets are also available in the cafeteria part of Lathams store.